On a scotch-brake (or flyer-lead, or scotch-tension) wheel the drive-band runs over a whorl fastened to the flyer. A brake-band (a simple string attached to a rubber ring or spring on one end and a tightening mechanism on the other end) runs over the bobbin-whorl. When you treadle, the drive-band makes the flyer turn. As long as the yarn is under tension, the bobbin is forced to follow the flyer and the yarn is twisted but not taken up. When you let go of the yarn, the bobbin is slowed down by the brake and the speed difference causes the yarn to wind on the bobbin. When the bobbin fills, take-up decreases, so you need to increase tension on the brake. Scotch-brake is often an option on double-drive wheels. In order to convert, just run both loops of the drive-band over the flyer-whorl and put the brake-band onto the bobbin-whorl. 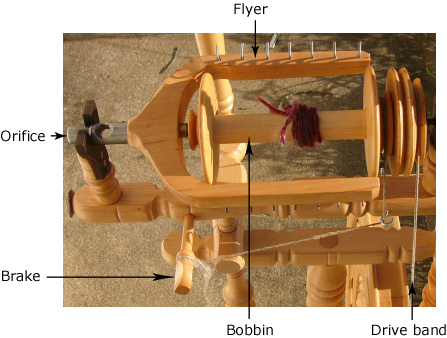 The bobbin is lighter than the flyer and therefore offers less resistance to rotation. A scotch-brake wheel without brake will therefore not have any take-up. Which means that you can reduce take-up to next to nothing for spinning fine threads or difficult fibres. If the flyer whorl is screwed onto the rear end of the flyer shaft, you need to remove the flyer whorl for changing bobbins. It may happen that, in order to have enough take-up, you need to tighten the brake so much that the wheel gets very hard to treadle. Fine yarns, difficult fibre - thick yarns are possible, but bobbins on today's commercially available wheels are so small that you have to change them every half-hour, which takes the fun somewhat out of spinning. Long-draw spinning, as it's easier to feed in large amounts of yarn at a time than with a double-drive wheel. I like scotch-brake wheels very much - and that even though my experience with them is limited to the Kromski Mazurka which is not the best wheel from the Kromski line. I think a scotch-tension wheel might do as an only wheel - just verify before buying that you can increase take-up enough for plying thickish yarns. And of course, as many double-drive wheels have scotch-tension option, you can get two systems in one wheel.